Nothing adds to a round of golf like an attractive location. From verdant fields to majestic mountains, a gorgeous setting can turn golf from a game into a treasured memory. Europe is home to some exceptional golf courses, many of which feature lush landscapes and backdrops that rank among the most picturesque in the world. Here are some European golf courses that golfers with an eye for beauty will not want to miss. 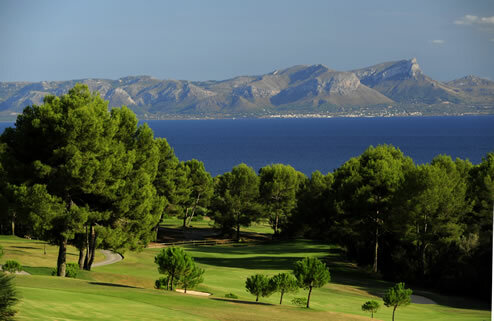 This course sits directly on the shore of the beautiful island of Mallorca, giving golfers a dazzling view of the Mediterranean Sea. The club gets its name from Alcanada, an island just offshore that features a scenic lighthouse. The view of Alcanada and the mountains behind it is one of the main reasons for the course's undeniable aesthetic appeal. The course is as lovely as its setting, and its ideal golfing terrain is framed by olive groves, oaks, and stone pines. Located 30 miles south of Belfast, the Royal County Down Golf Club rewards players with stunning views of the Irish coastline. Its links are set against the gorgeous backdrop of the Mountains of Mourne, and they stretch all the way to the sea. The club's fairways thread their way through massive sand dunes, offering a different striking view from every hole. Each of the club's two courses is speckled with golden gorse and purple heather. The famous "bearded bunkers," covered in hanging vegetation, add a challenge while enhancing the lush beauty of the courses. The courses themselves are considered to be among the best-maintained in the world. The Argentario Golf Club is one of the most spectacular attractions in the Maremma region of south-western Tuscany. The club runs through a natural oasis preserved by forests. The sparkling sea and gentle slopes surrounding the course give the region its own mild climate. An ever-present breeze keeps temperatures cool, and golfers can comfortably play at Argentario Golf Club year round. The beauty of the Orbetello Lagoon adds even more enchantment to the breathtaking panoramic views present throughout the course. Golfers looking for a truly unique and unforgettable visual experience will not want to miss this Mediterranean gem. Each of these golf clubs provides some of the best vistas that mother nature has to offer. Nothing beats playing a game of golf with the bounty of the natural world spread out in front of you. Both serious and casual golf players visiting Europe should take advantage of these amazing courses. Lyndsi Decker is a freelance writer that is currently promoting and helping answer the question how much does it cost to ship golf clubs? When she isn’t blogging she enjoys traveling and documenting her travels with photography.